Real BloodRayne Arm Blades. Real Awesome User Comments. 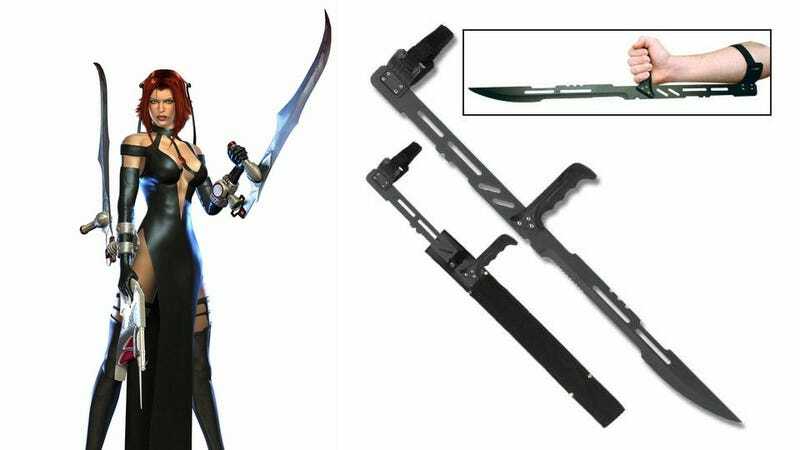 Believe it or not, you can actually buy this terrifying "replica" of the arm blade from BloodRayne. I say "replica" because it doesn't look much like the one from the series, not because it doesn't look like it could cut my face off. We're not here for the blade itself, though. Sorry, fans of vampires killing Nazis. We're here for a user review on the blade from Amazon. I have been a user of Ninja Forearm Machete Blade Full Tang Knife Swords (NFMBFTKS for short, pron 'nif-mib-fit-kis') for most of my career, and have some that are quite nice. As a professional mercenary and vendor of 'blood diamonds', 'blood coffee beans', 'blood Nike knock offs', and other 'conflict-zone' products, I find myself in need of a good NFMBFTKS regularly. I was a bit disappointed for several different reasons when this product arrived at my secure compound. First, this product is sold by a company called 'Martial Arts Land', which is the same name I gave to my home in the Democratic Republic of Congo. I wish the company had done more research into other entities who are also using that name before naming their company. The post office had quite a time, seeing as the shipping label read 'From: Martial Arts Land' and 'To: Martial Arts Land'. I hope they are not the people who have been getting my missing issues of 'Soldier of Fortune' magazine, as the 'help wanted' section is crucial to my ability to earn a living. Second, when I saw the description of a 'hi-tech' strap in the product description, I was fully expecting something computerized and perhaps operated by hydraulic machinery that would maybe shoot spikes into the arm if someone besides the owner attempted to use it. Imagine my disappointment when it was shipped to Martial Arts Land (my secure compound in DRC, not the original shipping company, see how confusing this is getting?) with a simple Velcro strap. There is no failsafe in the weapon as-shipped to prevent an enemy skilled in the use of ninja weapons from taking this particular NFMBFTKS from you and using it against you. Thirdly, I did not find the handle to be particularly ergonomic. After using this product as intended for approximately 8 hours a day, I have developed 'repetitive ninjitsu stress disorder' in my rotator cuff caused, I believe at least in part, to the lack of adequate wrist support. I saw an occupational health ninja who agreed with my assessment and suggested I spend hours on end standing under an icy water fall in the middle of the woods in the dead of winter doing ninja poses to help it heal. All in all, I can see myself using this as a back up ninja forearm machete blade full tang knife sword day-to-day, or maybe on light trips to the grocery store or library, but I will not be replacing my primary ninja forearm machete blade full tang knife sword any time soon. Those NFMBFTKS customers are a discerning lot!